Let’s be honest: looks matter. While a coffee bag’s visual elements have no effect on the roasted beans inside, design can certainly influence consumers when they make a purchase. Bags have a big job; they’re responsible for conveying information about a coffee’s origin and producer, how the coffee was processed, as well as information about the roaster, roast date, tasting notes, company values . . . the list goes on. Pack too much information on a bag and you’ll overwhelm people. Leave out important details and you might lose a purchase—or even a customer. Thanksgiving Coffee, based in Fort Bragg, California, recently redesigned its bags, cognizant of the impact branding has on customer perception. “The first big thing that I took on was changing the perception of our name,” says Marchelo Bresciani, the company’s in-house brand manager. He says Thanksgiving has always fought confusion from customers who associate the brand with the holiday rather than the act of giving thanks, so communicating “thanksgiving” as a verb was top priority in the redesign. Bresciani opted to break up the name on the bags, putting “Thanks” and “Giving” on separate lines to help make the distinction. “People are getting it; they see that it’s about giving thanks with coffee” he says. Thanksgiving Coffee worked with Pack Plus (out of Chino, California) to produce their new block-bottom bags. The bags are custom printed for the company’s two most popular coffees: Noyo Harbor French (fair trade and organic) and French Roast. Bresciani designed labels for Thanksgiving’s other coffee selections, which are attached to one of the pre-printed bags. While roasters like Thanksgiving have been around for decades and have the budget to launch a custom bag, many roasters are limited in their design choices. Putting together a custom-printed, fully compostable, zipper-seal bag isn’t cheap, and is often unrealistic for new roasters—especially with a standard minimum of 10,000 bags. Josh Bonner, owner of Foxy Coffee in Portland, Oregon, says an order that large was out of the question with its $5,000 price tag. “My budget was fifty dollars,” he says. While Foxy graduated from brown kraft bags, their stand-up pouches still feature a paper finish with printed sticker labels. Bonner says this makes it difficult to partner with some multi-roasters, who will only supply coffee from roasters that use fully printed bags—purely for the aesthetics. How do you go about designing packaging that says enough, but not too much? How do you convey your values in a succinct, attractive way? We talked with bag manufacturers and roasters—many who have recently launched a new design—to get insight into the process of making the perfect bag. Let’s unroll that tin tie. Gusset bags stand upright with contents inside. 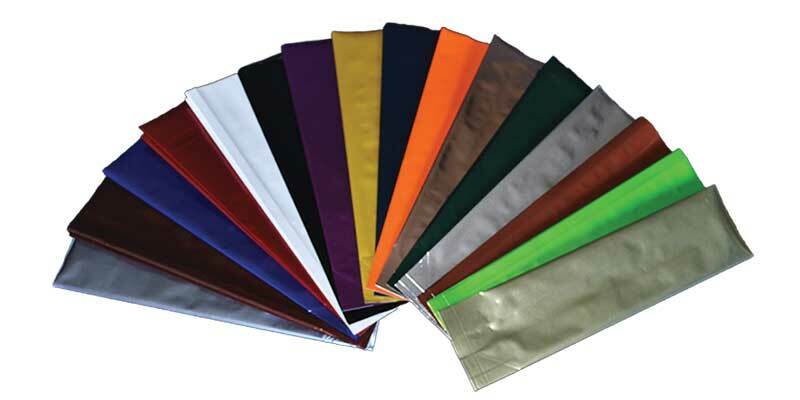 A wide array of color choices are available in a variety of materials: fully compostable, foil, and polyester. This bag “has been on the market for 100 years [not literally]. People are used to it. They identify with it, and it has a sleek look to it,” Jeffrey Teich, president of ActivPak Inc., says. 1000 Faces’ mission has always been the same: to bridge the gap between producer and consumer. Transparency is integral to this mission, so educating consumers on coffee origins was a priority for their recent bag redesign. “We want to be the type of coffee business that’s centered around quality, but in a really accessible way,” says CEO Jan Kozak. Block-bottom, Biotrade bags from Pacific Bag feature a zippered opening—a change from the tin-tie bags 1000 Faces used previously. Bags are custom printed, and textured labels use a color-coded system to indicate origin. Reds represent coffees from the Americas, blues indicate African origins, and southeast Asian coffees get purple labels. “People connect with visual elements,” Kozak says. Sustainability is a priority for 1000 Faces. These bags are fully compostable, even in a home composting environment. 1000 Faces worked with their in-house design team to come up with a package that would inform customers and help the company keep a contemporary look. Concise messaging tells customers what’s in the bag and a little about the company without being overwhelming. Savor Brands doesn’t have any singular best-selling bag, rather they have two top-selling styles, and a top-selling feature. 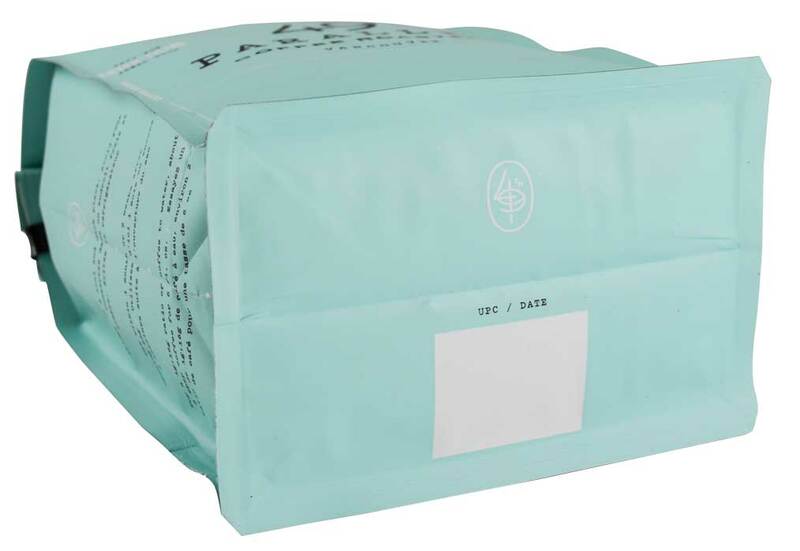 Quad-seal, box-bottom bags are a best seller because of how they sit on shelves. This style is all about beautiful presentation. Savor introduced V-cut-bottom bags because they sit stably without contents inside, and can be printed with one set of plates rather than two. Savor’s best-selling feature is the pocket zipper. This feature is available with quad-seal V-cut bags and quad-seal box-bottom bags. These combos are best sellers because of how customer friendly they are. The pocket zipper is great for coffee drinkers because it keeps coffee fresh and looks great on kitchen counters. Savor Brands is debuting their most high-tech bag at this year’s SCA Expo. 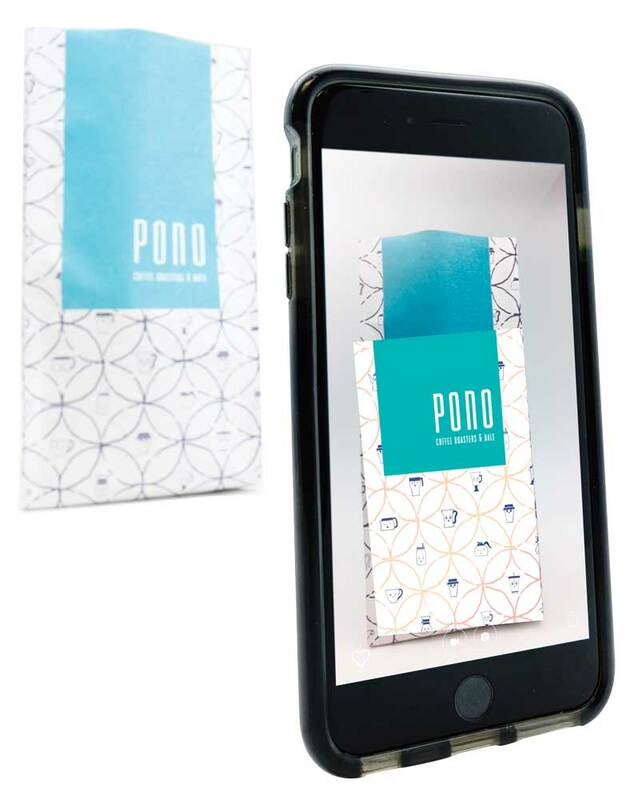 The Pono bag “beautifully demonstrates the latest innovation in design and functionality—and how companies can use augmented reality to bring their package to life” says Noelani Kumura, Savor Brand’s director of marketing. Pono is made of a substrate with a buttery soft texture that’s appealing to the touch. Customers can scan the bag to open a video telling coffee’s story from farm to cup for each varietal. City of Saints is located in the Bushwick neighborhood of Brooklyn, New York. The colorful industrial neighborhood is covered in murals, many by local artists who belong to the Bushwick Collective. City of Saints has murals by some of these artists—including Mr. Nerds and Dasic Fernandez—inside their roastery, and used them as inspiration for their packaging, a vacuum-sealed bag housed in a sturdy cardboard box. Joe Palozzi, City of Saints’ VP of operations, says they wanted a distinctive, solid, reusable package that looked great sitting on the kitchen counter. Quality four-color printing was also a priority to showcase the artwork. The boxes feature minimal information, since each box gets an information card with additional notes about the coffee. City of Saints partnered with Grey Packaging to produce the boxes, and Pack Plus for the bags inside. Palozzi says they’ve always used boxes, but will soon launch a block-bottom version of their twelve-ounce packaging to offer a better price point to customers. Savor uses a rotogravure printing system that delivers a polished, highly functional, fully customized bag at a cost-effective price point. Clients can customize every detail, including size and substrate, design and printing effects, and zipper and valve placement. Customization is key—and using Savor’s suite of services, your bag will be beautiful, potentially buttery-smooth, and customer friendly. For roasters who sell coffee in cafés and other retail outlets—like Whole Foods—considering how bags will be perceived on the shelf is a major driver for design. Perc owner Philip Brown describes the ideal bag as one that “sits proud on the shelf.” The company looked to bring the brand together in their recent redesign, using the same colors and design elements across their bags, website, and merchandise. Brown wanted the bags to be playful and serious to match the vibe of the company. “I liked the idea of keeping things super simple and clean,” Brown says. 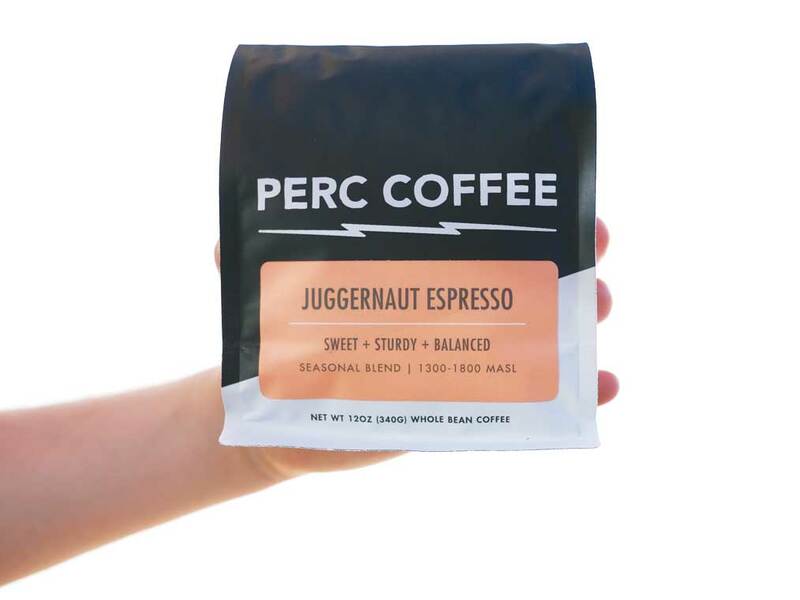 The bag from Savor Brands features Perc’s new logo (which emphasizes they’re a coffee company), along with an asymmetrical color-block pattern. 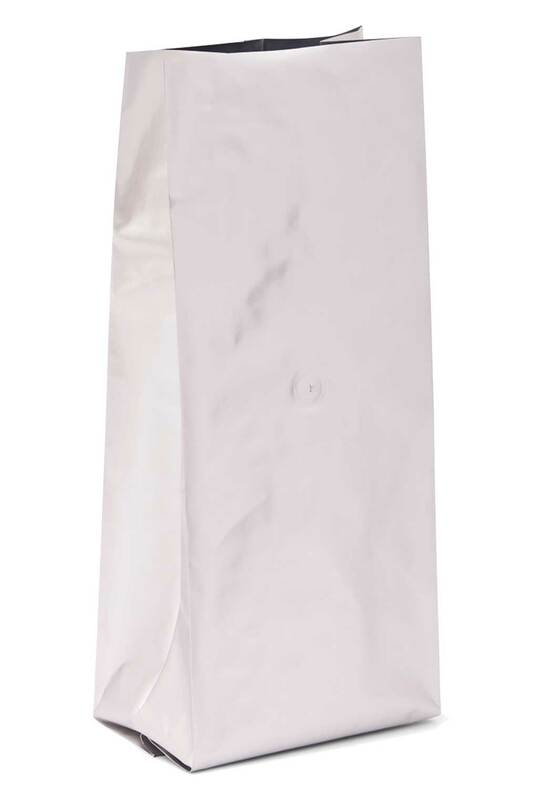 This bag is slightly wider than Perc’s old bags, making it easier to fit a grinder nozzle into the top. The flat bottom and zipper seal are also part of Perc’s focus on usability. Brown says the zipper seal is huge for keeping coffee fresh. Bags have a slow evolution, but every ten years or so, a new package format comes on the market. The most recent development for Pacific has been the development of the block-bottom bag (BBB). Four distinct panels give it a strong, crisp presence. The block bottom is display friendly and showcases bag art. “Side panels can be made out of an entirely different substrate from the front, back, and bottom of the bag, giving you an edgy look over the traditional square or oval window on the front or back of the bag,” says Kelle Vandenberg, Pacific’s vice president of marketing and communications. This bag combines the best features of two packaging formats—the side-gusset bag, and the stand-up pouch. 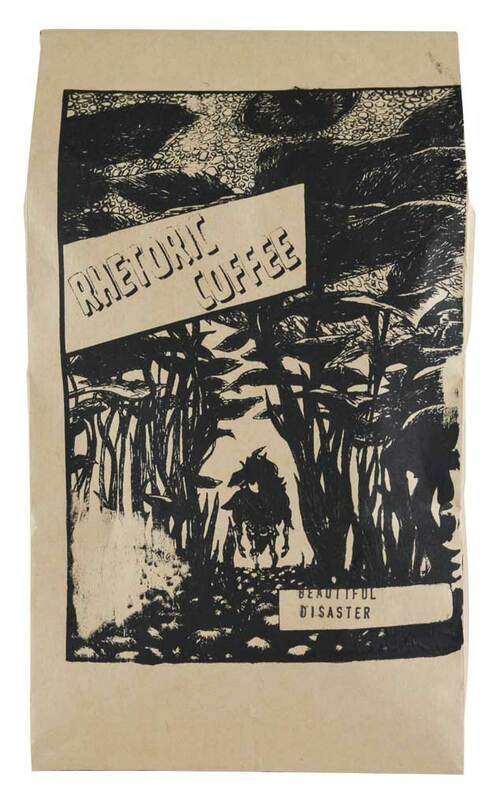 Rhetoric is a subscription coffee service offering something unique to their customers—bag art that rotates every two weeks. Jonathan La Mantia was the first artist to be featured on the bags, which established the “look” of Rhetoric’s bag art. The art submission process has become more streamlined over time, so the company now has a regular schedule of accepting and commissioning art. Rhetoric values sustainability, offering smaller bag sizes to discourage customer waste. Bags are fully compostable (without the tin tie). A screen printer burns the screens for the bags (supplied by Nashville Wraps), which are then printed by Rhetoric in house. Rhetoric treats every roast as a new release; a new piece of art is just one element. 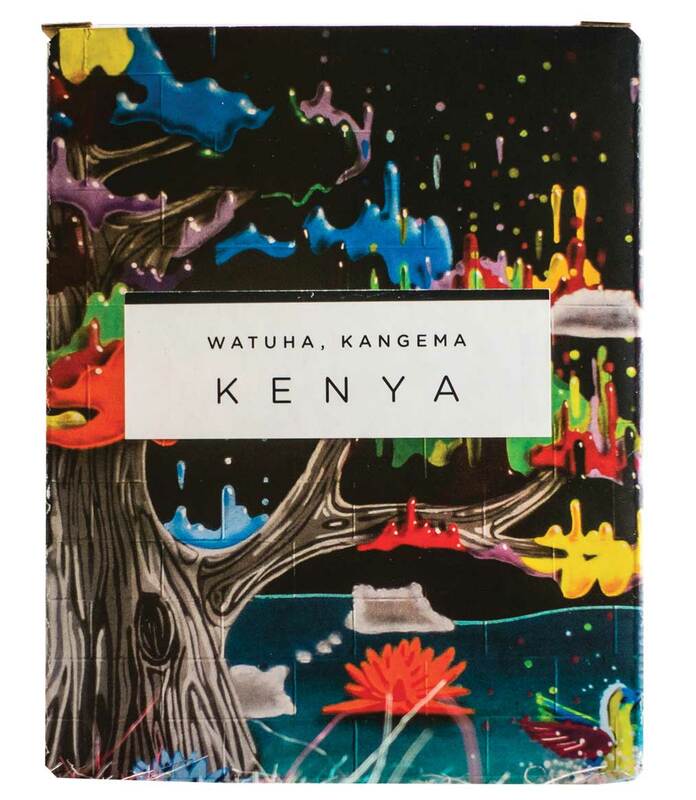 The company also compiles a newsletter for each release, discussing the art and artist, as well as the beans, their origin, and the playlist they listened to while roasting. Caryn and Mike Nelson are the founders of recently launched Junior’s Roasted Coffee. The brand itself is a concept based around the idea “Junior” is the Nelson’s offspring, so designer Elizabeth Chai ran with the concept in her bag design, using a child’s limitless imagination as inspiration. 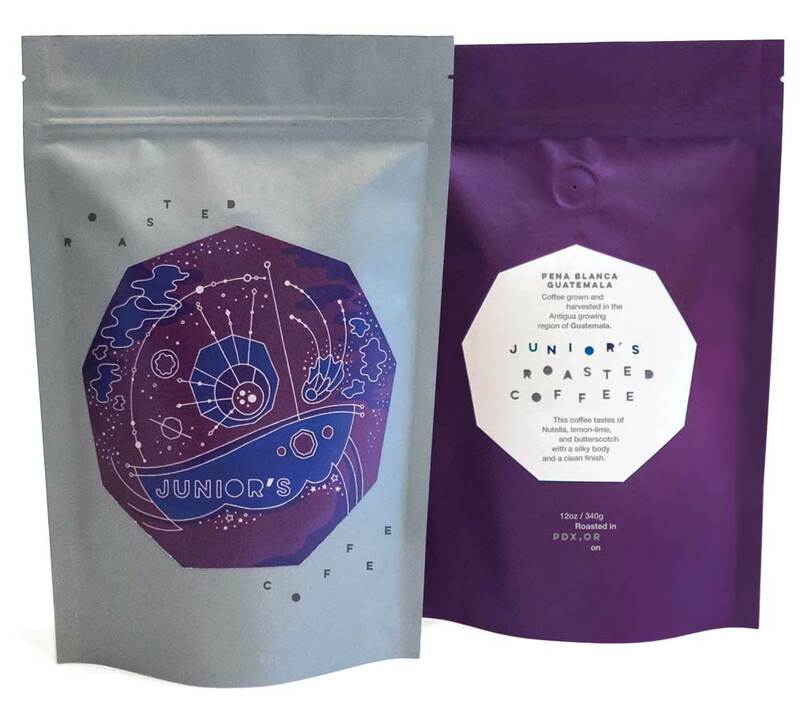 The bags were ordered through Pacific Bag; while the minimum order is 10,000, Junior’s was able to split the order into multiple designs, which gave Chai even more room to be creative. “I really pushed for the stand-up pouches because they offer more visual real estate,” Chai says. Junior’s is built on relationships with specific farms, so Chai made plans for each farm to have its own design and color to help customers draw the connections to origin. A strong focus on education and science-minded research helped seal the bag’s atomic retro styling. Chai used a vintage biology textbook illustrated by Charley Harper as inspiration. Environmentally responsible packaging was another priority area for the Nelson’s, but one they had to compromise on due to cost. Their first print run will use lined paper stand-up pouches; as the company builds a stronger foundation they’ll pursue more sustainable packaging options and water-based inks. For the last thirty years, Pacific’s best-selling bag has been the same—the five-pound, silver side-gusset bag. 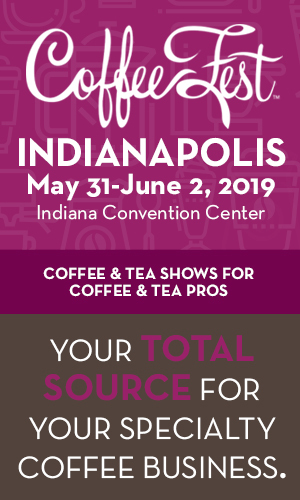 According to Vandenberg, most of the coffee tonnage moving in the US market is in five-pound bags. 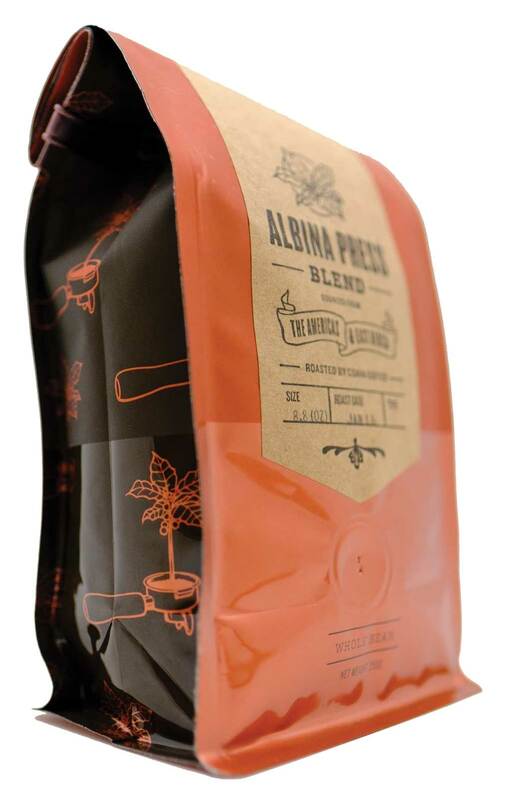 This package is the standard format for coffee bags—it stands up with contents inside. Fully customizable, including tin tie application, special valve placement, and a slew of printing methods. Unprinted, off-the-shelf products (of which Pacific has 400), have a one-case minimum. Pacific also sells their products through Amazon, making them the most easily accessible bag manufacturers we’ve encountered. “When we opened, the first bags we created were tall and narrow and fell over easily on a shelf, which drove me crazy,” says Sweet Bloom owner Andy Sprenger. 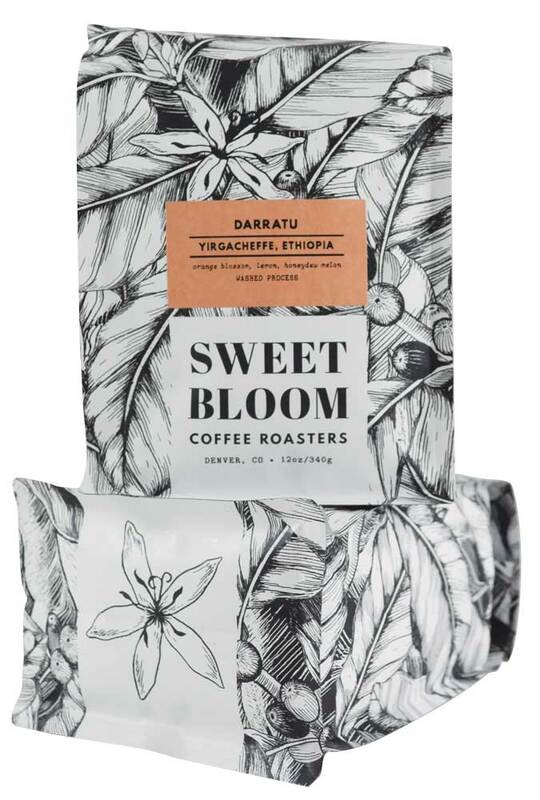 Sweet Bloom now uses custom-printed, block-bottom bags from Pacific Bag; labels are chosen from a palette of fifteen colors and are customizable in house. 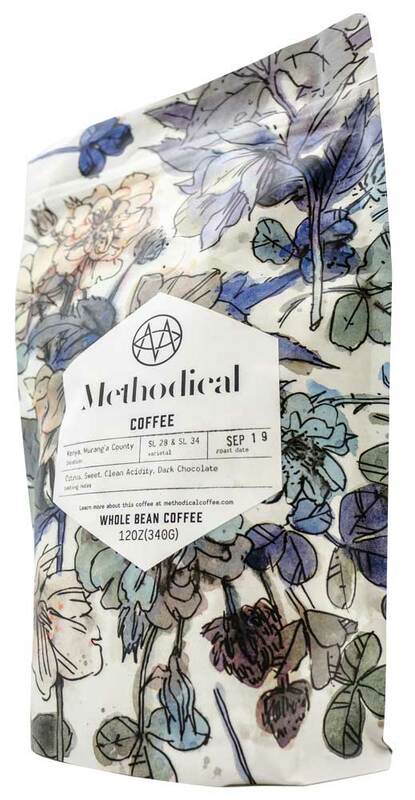 The Made Shop extended the botanical theme of Sweet Bloom’s original bag design so it was more apparent the company name refers to a coffee flower. Sprenger’s wife, Laurel, created an etching of a single coffee branch with berries and flowers that was turned into a wallpaper-like pattern by the design team. 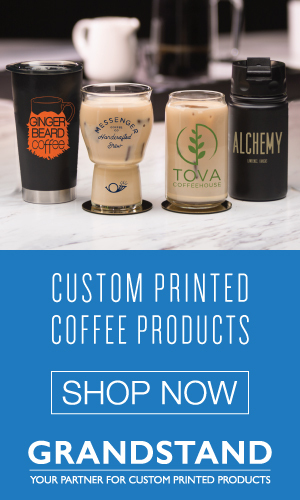 Sprenger says they opted for minimal verbiage on the label, knowing customers could get additional information from their website (also designed by The Made Shop). 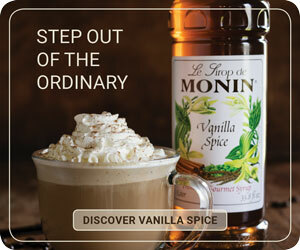 Labels include the coffee name, region and country, main taste descriptors, and process. “Our next step will be looking into packaging that can be recycled,” Sprenger says. 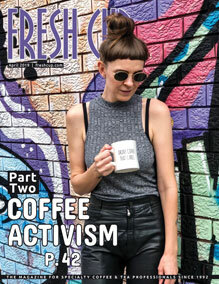 —Ellie Bradley is Fresh Cup’s editor and Rachel Sandstrom Morrison is Fresh Cup’s associate editor.